This comes as a pretty big surprise, but the source and the surety of the report don’t really leave much wiggle room: Tony Romo will be released by the Cowboys today, according to ESPN, and will retire from the NFL for a career in broadcasting. 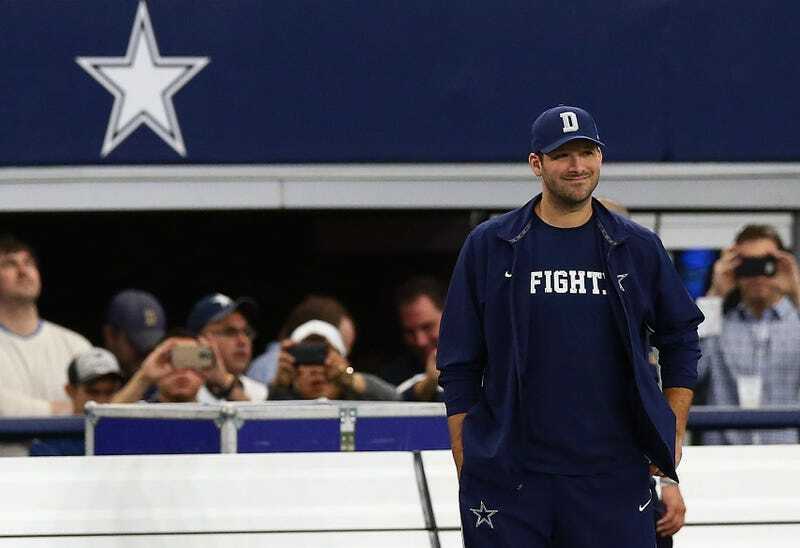 Romo has spent weeks making this decision, ESPN reports, and has apparently received offers from just about every network that broadcasts the NFL to become a color commentator. In going straight from the sideline to the broadcast booth, he follows another oft-injured Cowboys QB legend in Troy Aikman, and if Romo’s making this decision for his health, then seriously, good for him. Romo rarely got his due as an active player. But the man had a brilliant and unlikely career. Undrafted out of Eastern Illinois, Romo served only as holder for the first two years of his career. He finishes 29th in NFL history in passing yards, 21st in touchdowns, fourth in passer rating, fifth in completion percentage, and fourth in yards per attempt. Even the big traditional knocks on him don’t hold water. Romo was always injured? He played full seasons seven of the 10 years he was a starter. Romo couldn’t handle big situations? He finishes 17th in NFL history in game-winning drives, 14th in number of comebacks, and since his debut, he has the highest fourth-quarter passer rating of any quarterback in the league. I was shocked at how long ago that botched hold actually was: 2006, Romo’s first season as starter. But stuff like that sticks with you, I guess. Especially in Dallas. Romo may end up being the rare player for whom the big-market spotlight dimmed his legacy, or at least set extreme expectations. It’s far, far too early for this, but it’s a fun game anyway: Does Romo have a Hall of Fame case?